Can I Play Japan Jumbo Draw Online? Read 2 Reviews! Days of Draw: Mar., Jun., Aug., Dec. If you’re a fan of big jackpots, you’ve definitely heard of Spain’s Christmas lottery – El Gordo or “the fat one.” The lottery has definitely got its name right. While El Gordo is one of the top possibilities for winning massive cash during the holiday season, there’s yet another great option. The option is called Japan Jumbo Draw. Japan Jumbo Draw is similar to El Gordo in 2 ways. For a start, there’s a limited number of drawings per year. In addition, the lottery offers massive jackpots. It wasn’t open to international players until 2003 but today, everybody has a chance to test their luck and win a jumbo prize. Japan Jumbo Draw belongs to the Takarakuji Lotteries in the country. It’s the biggest one in the portfolio and there are 4 regular draws per year. That’s the biggest difference from El Gordo which offers just 1 Christmas drawing per year. The Green draw takes place in March and the prize pool is 206 million dollars. The Dream draw takes place in June and the prize pool is 232 million US dollars. A prize pool of 321 million dollars is available for the Summer draw that takes place in August. The biggest draw takes place in December (Year-End draw) and the prize pool is the biggest one – 617 million US dollars. Since its inception, Japan Jumbo Draw has been open solely to Japanese players. Luckily, things changed in 2003 when the lottery became international. Today, you have a chance to win one of the massive first prizes regardless of your location. Is Japan Jumbo Draw a Scam? With lotteries, if it sounds too good to be true, it usually is. Not in the case of Japan Jumbo Draw. Just like Spain’s massive El Gordo, this lottery is organized by a state entity and there’s whatsoever, no risk when it comes to buying tickets. The history of modern Japanese lottery started shortly after the end of World War II. That’s when the government began selling tickets for the Takarakuji lotteries. The word Takarakuji means fortune or treasure lottery and we have to agree that it makes sense. Today, Mizuho Bank has the exclusive rights to offer the tickets for the Japan Jumbo Draw and to hand out the prizes. This arrangement gives players even more security. If you want to buy a ticket, you can rest assured that the sum you’ve spent will guarantee your chance of becoming at least a little bit richer. How to Play Jumbo Draw? The rules of Japan Jumbo Draw are relatively simple, regardless of the fact that it’s quite different from other national lotteries. 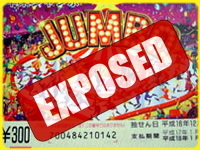 Every Japan Jumbo Draw ticket has 2 components – the group number and the ticket number. Usually, there are 100 groups in every single draw. There’s also a 6-digit ticket number. To win the first prize, players should have both the correct group and the correct ticket number. Unlike other lotteries, this one has a number of tickets that guarantee the first prize. Players don’t really need to choose their own numbers in order to win. Everything is pre-printed on the ticket. The only way in which players can test their luck involves choosing a group and a ticket number that they like. Keep in mind that the number of tickets for each drawing is limited. It’s possible for the tickets to sell out a long period of time prior to the drawing takes place. Thus, if you want to participate in one of the 4 annual drawings, you’ll need to buy your tickets as soon as these become available. Otherwise, you risk ending up completely empty-handed. Every year, long lines of people form in front of Mizuho bank as soon as the Japan Jumbo Draw ticket sales are announced. The queues are usually biggest in Tokyo. In 2015, more than 1,400 people lined up in front of one of the bank’s offices for the Year-End tickets. It was the Nishi-Ginza office – known throughout the country for the big number of winning tickets it sells each year. Because this is a festive lottery, Japan Jumbo Draw comes with excellent odds of winning the prize. In facts, the odds of winning at least some amount of cash in the lottery are 1 in 9. This is the main reason why Japan Jumbo Draw is the most popular Asian lottery and why it’s currently winning hearts across the globe. The top prize depends entirely on the drawing. As you’ve seen already, the Year-End drawing is the one that produces the biggest prizes. The number of first prizes will also depend but it’s always more than 20. For the latest Summer Jumbo Draw (the one in 2016), there were 23 first prizes and each one exceeded 500 million yen. The top prize can reach up to 11.5 billion yen or 97 million US dollars. Apart from the top prize, Japan Jumbo Draw offers quite lucrative additional opportunities to win. The second prize in the summer of 2016 was handed to 92 lucky individuals and it reached 920 million yen. A third prize is handed to people who match the winning ticket number for the third prize. The sum is usually announced in advance for the respective drawing – there could be serious variations from one drawing to the other. Fourth prizes are handed to people who match the winning ticket number that corresponds to the fourth prize and so on. There are 6 prize tiers in total and a couple of additional prizes. The prizes are paid by Mizuho Bank, which simplifies the process of obtaining the cash regardless of the amount. All of the prizes in Japan are paid in the form of a tax-free lump sum. International players will simply need to check for regulations in their own country. Can You Buy Jumbo Draw Tickets Online? The good news is that Japan has opened up its massive lottery to international players. You can buy your tickets online and test your luck. Keep in mind that the number of tickets available for international sale is limited. If you’re adamant on acquiring yours, make sure it happens as soon as the entries become available. Would you mind rating Japan Jumbo Draw? Japan Jumbo Draw is a huge hit in Japan and there’s a reason for the popularity of this lottery. With relatively affordable tickets, this game may even seem more attractive than El Gordo to some. The odds of winning something are spectacular, so don’t hesitate and get your tickets as soon as these become available. Okay, there are only 4 draws a year, but they are serious mega numbers. I had a hard time working through the group play and individual ticket lines, but it mostly makes sense. Added value, they don’t take tax. I’m still a little not sure about a lottery that is every three months but this generally looks good.